Home • Helpful Info • Is Algae Your Friend? How Soon Will a Pond Clear? Dont become alarmed at the sight of green water or algae in your pond. Algae, simple forms of plant life, naturally occur whenever water and light exist. Instead of considering algae a pond problem, you can learn to recognize and appreciate your algae as a friend. It tells you when you have either a gas quality problem or an excess nutrient problem. Chemicals can cut back the algae temporarily, but the dead algae material will form a fertilizer and start new algae. The biggest competitor for algae is the oxygenating grass. Otherwise you must filter the water and vacuum the bottom. FREE-FLOATING ALGAE (GREEN WATER). A free-floating alga signifies a gas problem, or a low oxygen/high carbon dioxide problem. Green water is prevalent during the first 90 days on pond balancing. The length of time depends on many variables such as weather, water chemistry, number of plants and fish, or the richness of your soil. Free-floating algae may also be present if nutrient value, usually in the form of fish food, is so high that the hair algae cannot develop properly. HAIR ALGAE. Recognizable as big clumps of long, stringy algae. Hair algae is a result of too many nutrients in your pond. By physically removing the algae, you physically remove the excess nutrients. The most probable source of excess nutrients is fish food; build up of dead leaves or plant material in the bottom of the pond, and fertilizer or dirt drainage into the pond. SLIME. Recognizable as the green growth on the sides of ponds, barrels, etc., slime produces 60% of the oxygen in your pond. Your pond will not be healthy until a good layer of slime develops. 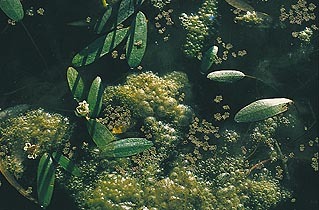 The oxygen-producing capabilities of algae are evident from the bubbles forming amid these clumps of free-floating algae. Every pond owner wonders, at some time, whether or not they will be able to keep their water clear. Youll need a little understanding of the natural processes a pond goes through to help you. In constructing and stocking the pond, everything has been rushed at dizzying speed compared to how Nature would have gone about it. The plants, fish, snails, soil, tap water, pond building materialseverything has been suddenly combined without time to adjust and interact in this hastily built environment. Within a few days of filling, the pond water starts to turn murky, and then it takes on a green tinge. Left unchecked, this will often progress to thick pea soup water. What has happened? Algae. Wherever there are light and water you will find algae. Algae are simple types of plant life ranging from microscopic specks to seaweed. There are hundreds of kinds of algae. The invisible spores that start algae are borne by the wind. Although unsightly, algae-filled green water is not unhealthy. The most common algae to affect the garden pond are the free-swimming types. Individually, you cannot see them, but together they make water appear green. Other kinds of algae grow in fine threads anchored to anything handy - pool walls, lily stems, even the shell of a slow-moving snail. These filamentous types of algae often look like a moss growing on the pool sides. In fact, a small controlled growth is desirable. While the free-swimming types will turn the water green or brown, the filamentous algae types are often associated with crystal clear water. This is evidence of the oxygen producing ability of algae. All green plants (including algae) absorb nutrients, convert it to new plant tissue, and give off oxygen as a by-product. This is known as photosynthesis. The nutrients are available in the water. Fish wastes, decaying foliage and excess fish food, add more nutrients to the water. Living creatures (fish, snails, frogs and tadpoles) need oxygen. Algae is natures way of insuring adequate oxygen will be present to support life. The best way to prevent excessive algae is through good pond balance. When the pond is in balance the water remains relatively clear. This is done by adding a mix of plants that will starve algae out of existence by consuming the available nutrients, and will cut off the sunlight needed for it to thrive. At the same time, they will also produce the oxygen essential to a healthy pond. Chemical control can also be used. This is especially useful in newly planted ponds, where plants have not had time to get established and algae has the opportunity to flourish. However, great care must be taken to select chemical algaecides that will not harm fish or plants. The product, Uberkler, is very effective in eliminating the free-swimming (green water) algae. For filamentous types of algae, use Cutrine-Plus. Recent research has produced a new kind of algae control product called Super Bugs - which is a totally organic method of discouraging algae growth. Various mechanical means can also be employed to control algae. Activated Charcoal/Carbon Pond Filters are very effective and can easily be added to all ponds. Keeping the decomposing material to a minimum will lower the quantity of nutrients in the water. This will provide less food for the algae to grow on. Prune water lilies and bogs of excess or old foliage regularly. Skim falling leaves off the water. A Pond Sweep will remove the silt and sediment that collects on the bottom. If you feed your fish frequently, your pond may build up excessive nitrogen levels. We have found an abundance of bog plants, which are heavy consumers of nitrogen and phosphates, will help. Ozone generators and UV light sterilizers aid greatly in ponds where fish are fed - both in killing fungus, parasites and algae and in removal of pollutants such as gas. It may take a couple of weeks, or a couple of months depending on such variables as amount of sunlight, time of year, type and number of plants, etc. The best advice is to keep algae under control while your plants have a chance to get going. Even in well-balanced ponds the water may have a slightly cloudy greenish tinge - this is normal and has the added benefit of camouflaging planters and providing the first food for baby fish. Use algaecides only as often as needed to keep the water clear. If the pond has been properly planted, the need for chemicals should gradually diminish as the plants begin to grow and thrive. PH can also affect the ecological balance of the pond. The average pond should maintain a PH of 7.5 to 9.5 with 9.5 giving the least amount of algae growth. In exceptionally acid ponds, Water Clarifier may be used to return the PH to 9.5. In exceptionally basic ponds, use Water Clarifier as a PH stabilizer. Only use Water Clarifier to change the PH balance. Water Clarifier can be used as directed on package. PH is based on dissolved oxygen counts in live ponds. Do not use these chemicals in conjunction with any other algaecide or fish treatments - they cannot be used at the same time. At all times, note reactions of fish to treatments. Whatever you do, DO NOT change the water! You will only start the balancing process all over again. After the first weeks, most ponds remain balanced for years. And a little patience goes a long way!